Manatees and Dolphins At Your Back Door. World Class Fishing.. Click Here to View our 360 Real-Tour. This one story, 3 bedroom/2 bath home in St James City, FL has been recently remodeled. Rear Yard is fully fenced for our canine guests. Use of Boat Lift can be arranged. View Our 360 Real Tour Newer tile flooring, fresh paint, French doors and updated furnishings await you upon check-in. The large well equipped kitchen has a table with seating for six. The three bedrooms have a king, a full and two twin beds making plenty of room for your guests. One bathroom has a tub and shower combo while the other has a walk in shower. 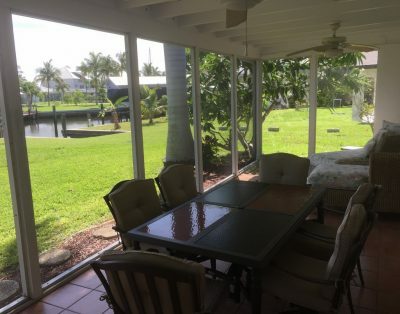 This home has a big sun room with a long view down the gulf access canal. You just might see a Manatee with babies, some dolphins or a school of Mullet! Located in a quiet neighborhood you can enjoy a bike ride on our island-long bike path or a long relaxing walk on the nature trail close by. Be sure and bring your camera! Seasonal (December 1-April 30) and Monthly Bookings – If you cancel your reservation at least 60 days prior to your arrival date, you will be charged a cancellation fee of $500.00. If you must cancel within 60 days of your arrival date, regardless of reason, no refund of deposits or advanced payments will be given. Off Season Daily/Weekly Bookings – If you cancel your reservation prior to your arrival date, you will be charged a cancellation fee of $250.00. Why This Property? : Canal. Quiet Neighborhood, Local Nature Preserves, world class fishing. awesom florida room. mark s. said...Jan 7, 2018...Great place to stay!...House was great! Clean and has everything you need. Easy access to fishing and in a quiet neighborhood. I would definitely stay here again. A guest from Monticello, MN said..Mar 7, 2017...We would stay again!...This is a nice house with a great view, comfy beds, awesome showers and a quiet location. It has a huge kitchen and updated bathrooms. We found several nice water-front restaurants on the island. Very bike and walker friendly. It was a relaxing place to come home to after a busy day out and about. Randal D. said...Jan 11, 2017...Great Place to Stay...Great solitude -- in a quiet community, one way in - one way out. Only there 30 minutes and saw four manatees. Fishing was good. House was spacious and very clean. Everything we used worked fine. Bed in master was very comfortable. Water pressure in shower was great! Only complaint was that there was used coffee grounds with mold growing on it in the coffeemaker. Good places to eat & drink. You don't need to leave the island -- unless you want to go to a beach. Would definitely stay there again. My Response Hi Randy. Thanks for the nice review. I wish you would have called or emailed me to let me know about the coffee maker. I would have sent someone right over to correct that. But it looks like you remedied the situation...thank you for being such a great guest! !